Fossils were a mystery for thousands of years; then a few pioneering scientists realized that they were the remains or traces of once-living organisms. Well-known bone-type fossils are actually rocks, the result of a process called mineralization in which minerals replace decaying tissue. This process is shown and explained. All of the other fossil types are also explored. The rarity of fossils is dramatically presented, and strange things sometimes mistaken for fossils are identified. There’s an introduction to fossil expeditions and a summary of how fossils contribute to our understanding of the earth and life on it. 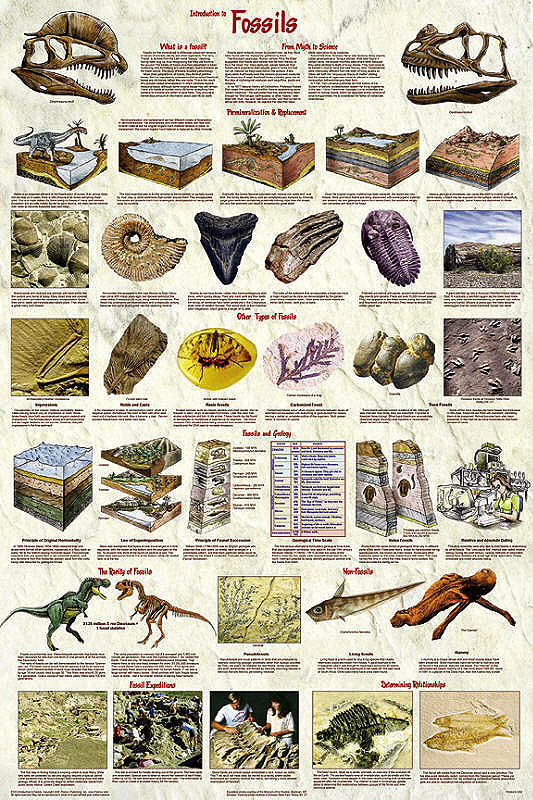 There is an especially helpful section on the relationships between fossils and geology. It covers the principle of original horizontality, the law of superimposition, the principle of faunal succession, the geological time scale, index fossils, relative dating, and absolute dating. All of this is conveyed through detailed illustrations showing the processes, excellent photographs of representative specimens, and interesting and informative captions. This poster is a great aid to museum interpretive programs and is extremely beneficial in the study of both life and earth sciences..